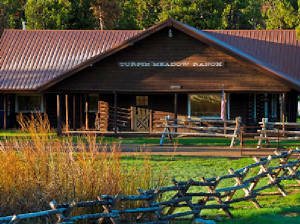 As of October 21, 2011 Turpin Meadow Ranch in Jackson, Wyoming has been foreclosed on by First Interstate Bank. Dude Ranch Consultant has been hired by the bank to help with the ownership transition and manage the ranch until a new owner is in place. This ranch is in the Bridger Teton National Forest, one hour north of Jackson Hole. It is a forest service lease with a guest capacity of 40. The ranch will be open for teh summer 2012 season offering all inclusive 3, 4 and 6 night packages. Unless a new owner is operating the ranch Dude Ranch Consultant will manage the ranch through this summer. Manage transfer of website domain name. Build new website. www.turpinmeadowranch.com . Manage legal transfer of Wyoming Livestock Brand. Pull shoes and de-worm ranch horses. Arrange for and haul horses to winter pasture. Deal with Health Department issues. Shut down plumbing and winterize ranch buildings. Repair structual roof damage on ranch cabin. Contact pass guests and work on potential new reservations.